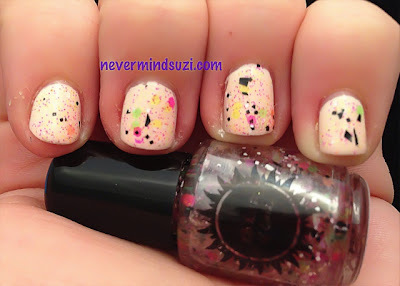 I love, love, love Sunny (365 Days of Color) and her amazing polishes!! I've got 2 full collections to show you over the next few weeks! Excited?? I'm going to start with the "Like Totally 80s" collection. A selection of neon glitter toppers. Today I've used Neon-O-Rama, the multi-coloured beauty of the bunch. I've popped 2 coats of it over Lime Crime - Milky Ways to get the full effect. It's a clear base with neon pink, yellow and orange micro-glitters, neon pink, yellow, green and orange hexes and black and white shards. Here however over Color Club - Daisy Does It, not so hot! But hey, you win some, you lose some. And Daisy Does It is a pretty colour on its own. Proof that a good mani can go bad.